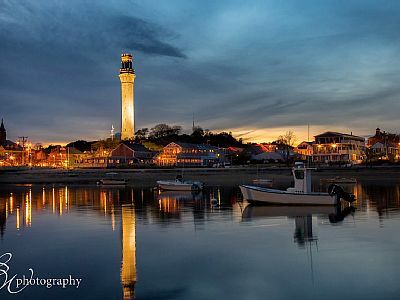 The Town of Provincetown was incorporated in 1727, but its history begins much earlier since its well protected harbor offered excellent protection from storms. The European explorer Gosnold recorded a stop in Provincetown as early as 1602 and the harbor was the site of the first landing of the Mayflower. The Pilgrims signed the Mayflower compact in the harbor, to codify the way in which they were going to administer the new colony they intended to establish, the first permanent settlement didn't take place until 1700. Provincetown grew very slowly during the 18th century and its population fluctuated with the price of fish. After the Revolution, the town boomed and its population rose 276.6% between 1790 and 1830. Despite its relative lack of good farm land, by the middle of the 19th century, Provincetown had developed as the prime maritime, fishing and commercial center of the Cape. The Civil War, which destroyed so much New England business, only provided more markets for Provincetown's fish. In the 1920's the artistic and literary productions of the town were of international repute and the abandoned sites of maritime businesses became the new homes of the seasonal visitor as sail lofts, warehouses and barns became studios, galleries and shops. Today, the wealth of preserved historic buildings combines with the lure of the sea to support a huge tourist and summer home industry.